It is the year of Our Lord 1307, and by papal decree, Templar Knight Arucard de Villiers is a hunted man. One of a handful of mariners to escape the Inquisition and Philip the Fair’s treachery, Arucard sets sail for England, where good King Edward II has outlawed torture. While the Crown is more than happy to offer exile and create a new Order to accommodate the famed warriors of the Crusades, such assistance comes with a price. But is the cost one Arucard is willing to pay? The world in which Isolde de Tyreswelle exists defines her as chattel. Nothing more than a means to an end, she is a puppet in her unscrupulous father’s dastardly play and is thrown into the courtly arena. To further her family’s political aspirations, she is betrothed to a man she has never met and, with her husband, must fight to survive the intrigues and betrayals of her new life. With good reason, she fears men. Can Isolde learn to trust Arucard before they are destroyed by their enemies? The charming Dionysia de Beaumais conceals more than her face behind a scarf. Despite her pleas for mercy, she is betrothed to a man with whom she shared pleasant conversation at court, and she dreads the inevitable disclosure of a painful past and her most intimate secret. But the giant knight is not what he appears, and he wins her heart. When an old enemy resurfaces, threatening her newfound happiness, Dionysia risks everything to save Aristide. 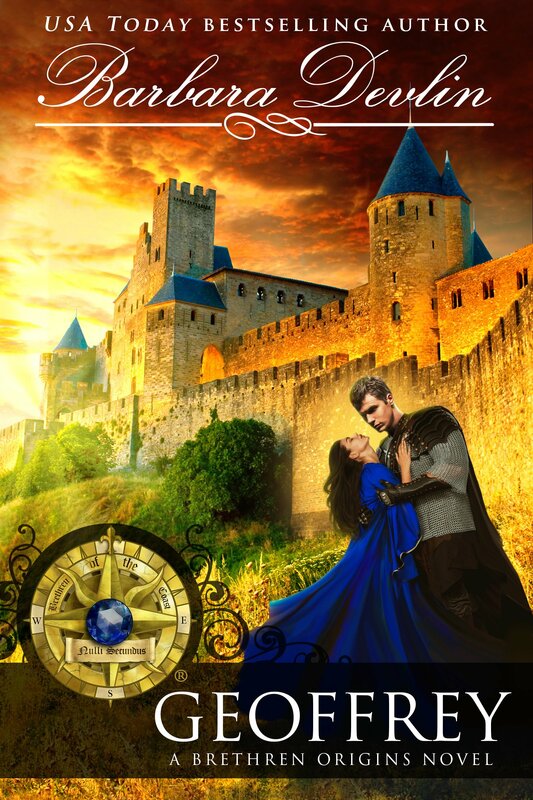 Reconciled to an arranged marriage, Nautionnier Knight Aristide de Laurentiis takes matters into his own hands and expresses interest in a mysterious but modest lady blessed with sharp intellect and wit, and His Majesty obliges the one-time Templar. When Aristide discovers the cruel truth his gentle wife hides behind her veil, his insatiable lust for revenge threatens to destroy them. Can love conquer evil and heal old wounds? The eldest daughter of a Privy Councilman to His Majesty, Lady Hawisia Van Goens is a reserved but levelheaded woman born and bred to serve her intended lord and master, without complaint. Dedicated to duty, she accepts her position as wife to a powerful man, with unimpaired aplomb, and refuses her husband naught. She supervises the household, maintains the undercroft stores, and charms local dignitaries. Although Hawisia is well aware of Morgan’s preferences, because he reminds her at every turn, she endeavors to fulfill her position, offering him everything he requires, except the one thing she holds most dear—her heart. Can she settle for friendship when all she ever wanted was love? The youngest and brashest Nautionnier Knight in service to the Crown, Morgan Le Aguillon embraces English life and all its temptations, much to the Brethren’s displeasure, thus he is in no hurry to wed. When he is commanded to take a bride, in a show of loyalty to the King, he is disappointed to learn his future mate is the older sister of the woman he desired. Once they assume their roles as stewards of a conflicted region, he manages his new chatelaine as he would any other servant. Soon, he realizes he woefully underestimated his lady and discovers her unimpeachable beauty. Given Morgan considers himself a consummate romancer, what happens when he courts Hawisia, in earnest, and all his skills prove futile? A dutiful daughter born and bred to serve, Lady Gertruda Marinova anticipates her impending wedding to a nobleman she has long admired. In the eleventh hour, when the King commands she marry another, a knight she knows not beyond his name, she is devastated. But heartbreak turns to anger and then sheer terror, when she is confined to the Tower because her prospective groom rejects her, in defiance of His Majesty. Desperate to protect her parents from the Sovereign’s wrath, she tries but fails to reason with the resistant groom. Can Lady Gertruda sway her reluctant fiancé, fulfill the Crown’s dictates, and save their heads? Former Templar Knight Sir Geoffrey L’Hernault believes the marriage sacrament culminates in eternal damnation, and no one—not even a king, can convince him otherwise. Although Lady Gertruda is innocent in the games men play, her fate is inextricably intertwined with his, along with the lives of his fellow Brethren. While he is happy to pay the ultimate price to save his soul, he cannot in good conscience imperil her life. But the lady manifests temptation such as Geoffrey has never known, and she brings with her a persistent swain whose devotion to Lady Gertruda could endanger them. Will Geoffrey defy the Sovereign or take a chance on love?